I actually made this for Thanksgiving, but I haven't had time to post it until now! I was so excited about hot chocolate week that I just couldn't wait. But now I would like to share this with you. I feel like every once in a while I need to post something healthy so you guys don't think I ONLY eat sugar. I could see how you might think that is the case, but we do eat a veggie every now and then, I promise! 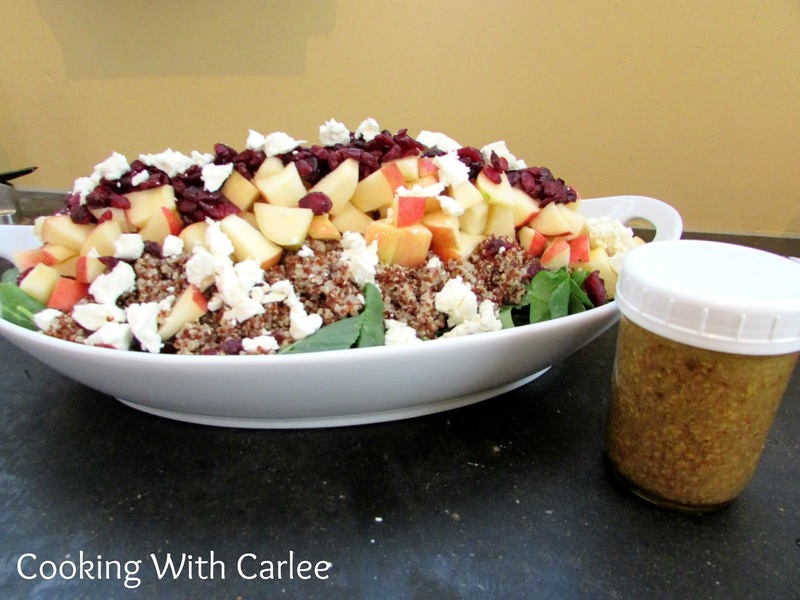 The caprese quinoa salad I made this summer was such a hit, I thought I would switch it up for fall. My brain immediately went to dried cranberries and apples, but I wanted it to be a little more savory than that. So I threw in a bunch of baby kale. Some spiced walnuts and a little goat cheese really brought all of the fall flavors home. It was a fun and fresh side dish that acted as a perfect counterpoint to all of the traditional Thanksgiving dishes. Cook quinoa according to package directions and allow to cool to room temperature. Arrange cleaned and dried kale in serving dish. 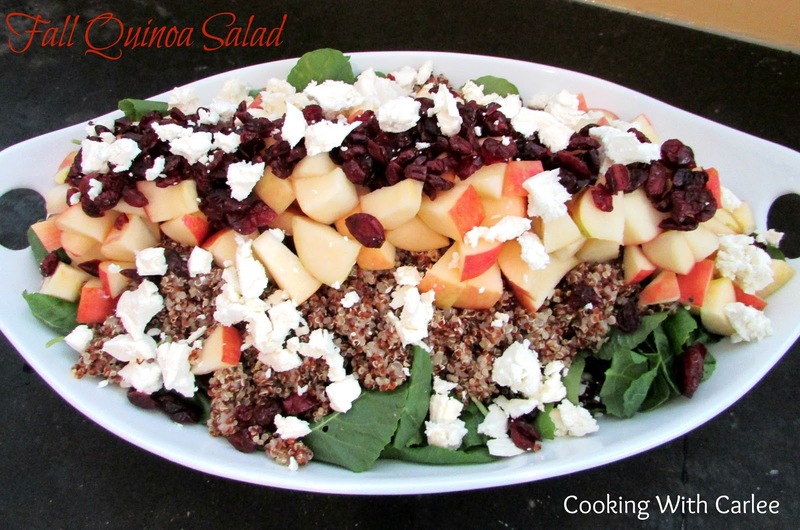 Top with quinoa, apples, cranberries and goat cheese. Just before serving, dress with vinaigrette and walnuts if desired. I'm the same way, I don't always eat sugar, lol!! This sounds so yummy and super festive!! We do have sweets a lot more often than is necessary because of the blog, but I try to balance it out with a little kale every now and then! This looks so pretty and delicious, Carlee! Lol, I was thinking the same thing the other day, that I wonder if my readers think that I only eat sugar!! =) Pinned. My husband loves all of these ingredients. It something we'd both enjoy! Have a great week!! Pinned! Hi Carlee, This sounds so healthy and delicious. I pinned the recipe. Thanks for sharing as we love salads in my family!! The eggnog pancakes were so good and now I have them ready for Christmas morning. I know you will come up with something delicious!! Wishing you a wonderful week and if I don't talk to you again have a Merry Christmas! Thank you! You have a Merry Christmas too, Julie! I can't wait to try the pancakes. Love this combination of flavors! Thanks for joining us on the Tasty Tuesdays Linky Party. I hope you will join us again in two weeks (on Dec 29th). Thanks, see you in a couple of weeks! I was just saying that I want to find more ways to use quinoa. THis sounds so delicious -and I love the recipe for the maple vinaigrette! I can't wait to make both! I have been mixing quinoa in with rice or using it in place of rice for some time, but I have really been enjoying using it in salads lately. It is so good! Thanks Miz Helen! I hope you have a wonderful Christmas as well!